There is also Twinbee aside from Gradius III and IV Vic Viper. Great resource Greg. I still haven't built mine yet. 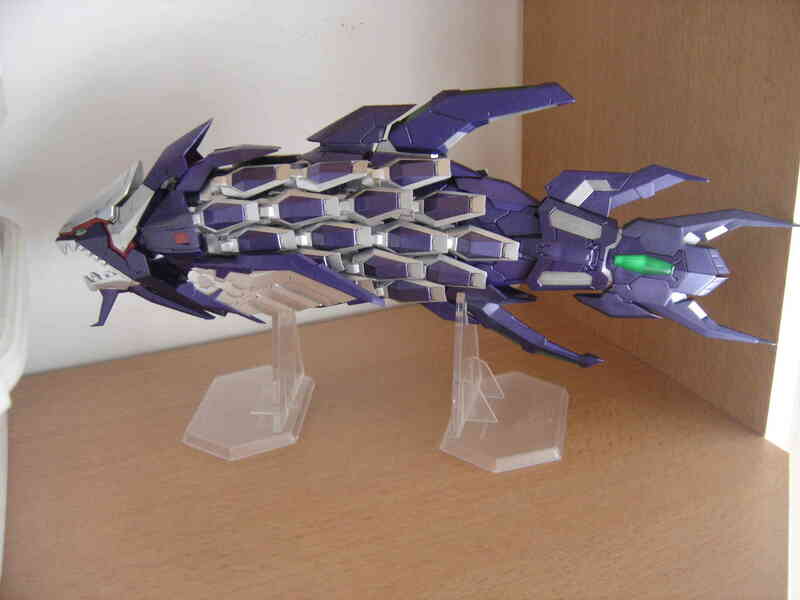 One of the items on my to-do list since I recently bought a 3D printer is to design/build some sort of a model of the Aegis from Raiden Fighters. As far as I'm aware there's never been a commercial model kit of that one. Inspired by the glowing pilot suits in Macross: DYRL, I've painted the pilot figure with reflective paint and the ultraviolet SMD mounted into the cockpit shines on the pilot, making the reflective paint shine beautifully. That missing engine cover still makes me mad. Hope you didn't pay too much for this. Huh? It's not missing, it was removed on purpose. It was painted by a professonial, who painted it to look like it has been on a heavy battle and got lots of hits. And I paid nothing, I got the model and the paintjob as a birthday present! Here's an update on my Tumblr page with images of my work. 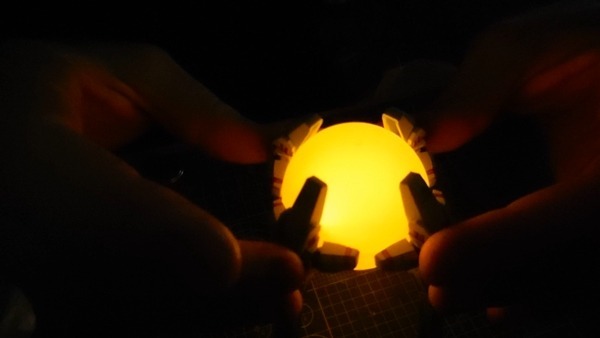 The orb is nearly complete! Here's the 5th video on YouTube. Woah! I haven't looked at this thread since you started the R-9 project, so I'm reacting to the entirety of what you've done so far. Impressive work. Thanks. I've now done the main painting. I just need to do the wiring, assemble, apply decals, etc. I do this more than playing video games these days, although starting this project has made me play R-Type Final more and I've unlocked a few new ships. I've gotten back to the R-Type model. Here's video 7. I recently did a Battlestar Galactica Cylon Raider, and that was easy to light because the ship is essentially a flying saucer clamshell. This R-Type ship is proving to be more work because I had to strategize where to feed the wires through to make it work. At the end of the 9th video, you can see the Arrowhead put together and the lights running on it. here is a photoset/writeup update on my Tumblr page. I'm nearly done! Work on these is going painfully slow but they still came out faster than the Iron Fossil figma. Hey, it's WonFest again! Tinypic is fucked up today so just follow the links. It looks like their will be commercially released models of both TFIII's Styxx and TFIV's Rynex produced by company FREEing (posibly under the Shooting Game Historica banner once again) Also reported on Sega's japanese twitter. No news on Plum's Vic though?? Plum's Vic Viper is scheduled for this winter. The flyer I recently received says that both the Viper and Twinbee kits are "dilligently being developed." No estimated date, however. I started collecting Shooting Game Historica models recently and now I've basically exhausted all the ones I could find for a reasonable price so I ordered the Darius Burst model kit from HBLJ. I've heard Plum is good entry level because they're snapkits and look decent even without painting. Are the Atelier Said Vic Vipers really that bad btw? Also those old school Thunder Force kits look great, I couldn't find them on E2046 website but they do have the Vasteel and Gauntlet from TFV as coming soon. I'd love to get more kits to build but I struggle to find a UK/EU based online shop that sells them. Been eyeing those Ikaruga kits on eBay too, are they painted to begin with or definitely require paint? The thunderforce kits look absolutely amazing. I live in the UK how do I get my hands on them when they are released? If I don't get my hands on a rynex with craw. My life will never be complete. The gauntlet ship looks gorgeous . Been eyeing those Ikaruga kits on eBay too, are they painted to begin with or definitely require paint? Yep, both the black and white Ikaruga model kits require painting for that cool detailed and weathered look/aesthetic or you can go the non-painting route if so desired. Got a few cheap kits to try out first, that'll help me decide if I'm good enough with painting to tackle something like the Ikaruga kits. Wouldn't want to make a mess out of that Also looking at Plum's website there's nothing on the teased Vic Viper and same for the Thunder Force ships on the FREEing website, guess we just wait. It's really cool! As you can see on the pictures, each scale can spread. 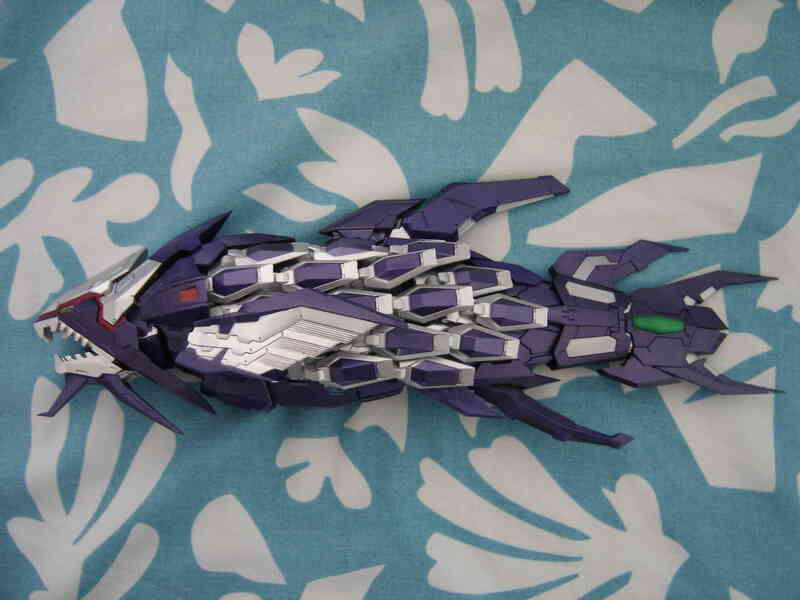 The same goes for the side fins, and the mouth can be opened or closed. 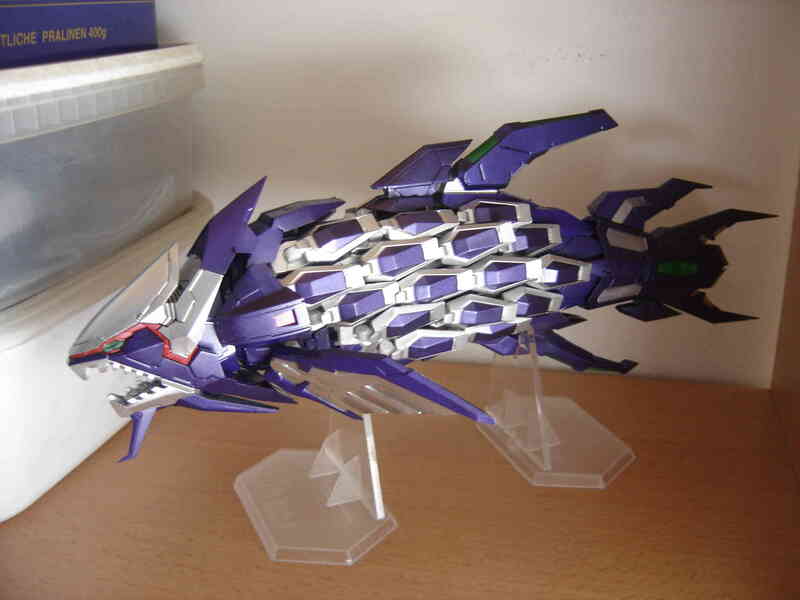 The main body itself is seperated into 3 parts with a bit of articulation so the front and back can slightly bend sideways. According to the small manual, the tail can open to reenact the Burst firing but it seemed like you had to apply some force on it so I didn't want to risk breaking anything. The box came with the two stands as well as a small transparent Silverhawk (not pictured) with its own stand. Sly Cherry Chunks : Your Hungry Gluttons are a-ma-zing! I already saw them earlier but I think I forgot to comment on them. I've thought about doing a brute or heavy. The models would require some modifications, not just a different paintjob. Might be a fun project one day, I have one casted up in clear red that needs cleaning up. That's an awesome knight! Mines in the mail. Hello lovelies, Plum's twitter page has lots of cool pics of the new Twinbee kit. They're planning a Winbee kit for a release next year. I haven't touched my R-Type kit for a long time. Getting it all set to go really stressed me, plus I was having trouble with my damned soldering iron. I am only a few steps away from finishing the kit. As far as Plum kits go, this is my first one so far. I had to sand some of the pegs to improve the fit. I dunno about other kits. I think they've gotten better. 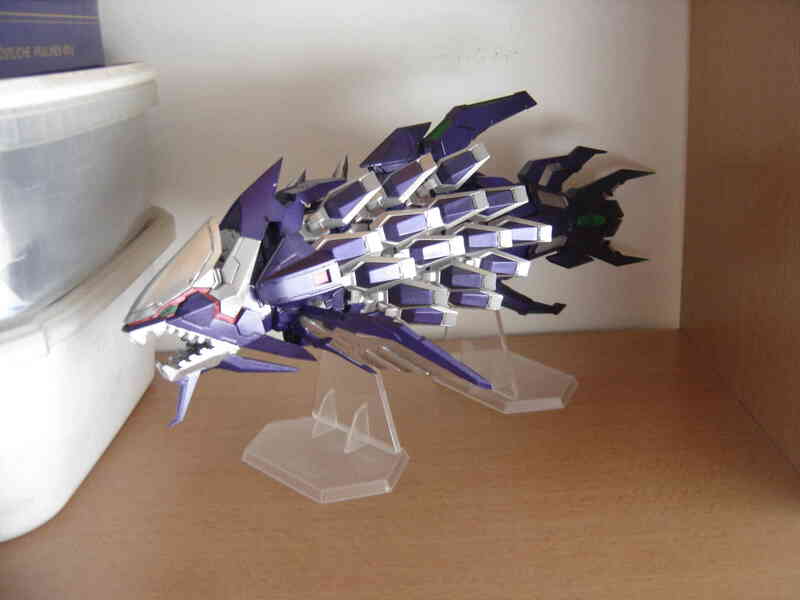 I'm strategizing how I can light up the Darius Burst kit by Plum too. It'll be a lot easier, but it will require cutting out some plastic to get the cockpit to glow. It's been since re-popped as a Darius Burst Chronicle Savior kit. That Figma looks amazing, but it's waaaaaay to expensive for me. Just when my coil was reaching the green line. I thought I was very close to finally finishing the Arrowhead model, but I'll have to redo the electrical connections for the force orb. 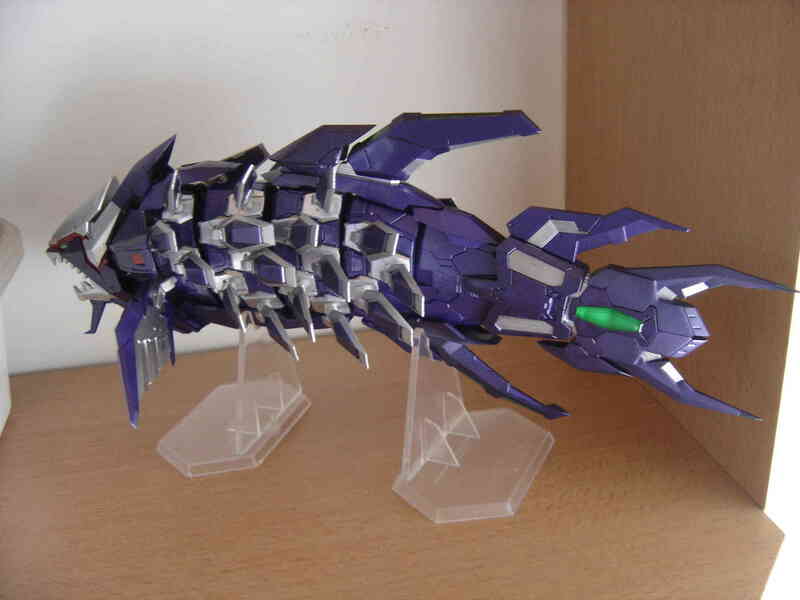 In other news, I believe Plum's Vic Viper from Gradius 4 has been postponed until spring of next year. Would be good to finally see that Arrowhead complete, don't give up yet!